This book forms a contribution to the vexing question of the origin and growth of the Targum to the Prophets. It provides an in-depth analysis of the Targum of Judges on the basis of new materials (unpublished manuscripts), a new tool (bilingual concordance) and a new method (analysis of consistency). 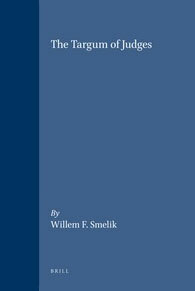 A critical review of previous research concerning the Targum’s origin and growth is followed by an analysis and collations of many Western manuscripts, a systematic comparison of the Targum with the ancient translations, a study of its exegetical traditions and a thorough examination of its consistency. On this basis it is suggested that the Targum assumed its basic form in the second century CE, due to the emergency of the rabbinic tradition, but outside the context of the synagogue.